Chemical Science, Nanoscale and Nanoscale Horizons are delighted to sponsor the RSC Chemical Nanoscience & Nanotechnology (RSC-CNN) Group Annual Symposium 2018, taking place on 6 – 7 September 2018 in London, UK. This event on nanotechnology for energy and environment is organised by the RSC-CNN Group and chaired by Professor Junwan Tang (UCL) and Professor Radim Beranek (Ulm University). The symposium covers recent developments in fundamental studies, novel material development and reactor engineering in the field, and aims to provide a forum for researchers to exchange ideas as well as discuss recent advances and challenges. A program consisting of international experts in the field will cover topics from thermal catalysis to water splitting. Don’t miss out on your chance to attend this exciting symposium – find out more and register here! The thematic focus for IEEE NANO 2018 is Nano-Enabled Smart Things: new materials, devices and systems that can benefit humanity through applications in communications, energy, healthcare, food and environment. The conference themes will encompass experimental contributions as well as modelling and simulation. Highlights from Nanoscale Horizons so far in 2018. We are delighted to see the support from the community as you continue to contribute outstanding articles showcasing new concepts of exceptional significance to the nanoscience readership. To celebrate the nanoscience community’s excellent work, we have picked out some content highlights for 2018 so far, which we would like to share with you. All articles are free to access until the end of June – we hope you enjoy reading them. At Nanoscale Horizons, our reviewing standards are set extremely high to ensure we only publish first reports of new concepts across the breadth of nanoscience and nanotechnology research. Click here for 2018 Highlights in our sister-journal Materials Horizons or sign up to our newsletters for more regular journal-specific updates. 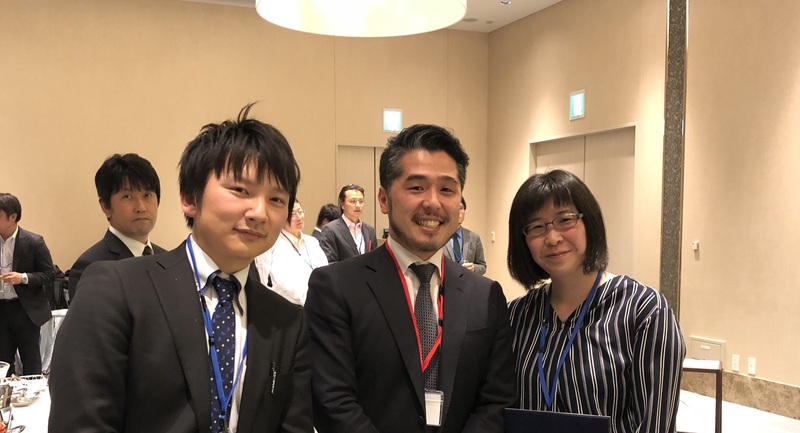 We are delighted to congratulate two prize winners from the 16th Annual Meeting of Society of Nano Science and Technology, organized by The Society of Nano Science and Technology, which was held at the University of Tokyo from 10 – 12th May, 2018. Supramolecular polymers are promising architectures for different applications in the materials or biological fields between others. Their inherent dynamicity and versatility give to these materials interesting application-related properties but at the same time make their construction intricate. The control over these assembly processes of supramolecular polymers is still nowadays a big challenge to overcome. Therefore, there is a need of new methods that shed light in the understanding of the supramolecular driven assembly processes in different situations. In a recent study reported in Nanoscale Horizons, Montenegro et al. conveniently employed water micro-droplets to investigate the assembly of tubular peptidic nanotubes in a confined space. They employed cyclic peptides decorated in one hand with histidine that confer the system a pH-responsive self-assembly and in the other hand with a pyrene moiety that serves as a fluorescent reported of the fibrillation process. Figure 1. a) Structure and pH-dependent self-assembly of the cyclic peptide (CP1) b) Histidine hydrogen-bonded networks and pyrene p-stacking driven aggregation of single peptide nanotubes by hierarchical micro-fibrillation. 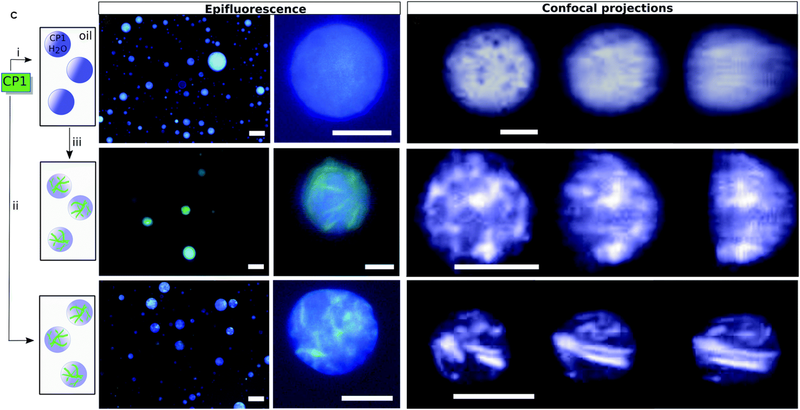 c) Supramolecular polymerization of CP1 in confined spaces [(i) CP1 in water (1–2% w/w); (ii) CP1 (1–2% w/w) in HEPES 30 mM at pH 8; (iii) addition of propanamine] shown in epifluorescence images and confocal microscopy projections of individual droplets. Scale bars from left to right are 20, 5 μm, and 10 μm. Images reproduced with permission of the Royal Society of Chemistry. The observed deformation of the droplet upon basic pH trigger was produced by the strong directional self-assembly reflecting the strong directionality of the process. These findings with the one-dimension hierarchical assemblies open the possibility to a better comprehension of the physics and mechanism involved in the assembly of tubular networks in confined environments. Moreover, the reported system can already serve as a platform to further study such assembly processes in a biological scenario and eventually be applied for several biomedical purposes like drug delivery. Nanoscale Horiz., 2018, Advance Article. Article written by Dr. Julián Bergueiro Álvarez (Freie Universität Berlin). His current research is focused on thermoresponsive helical poylmers, polymer-gold nanoparticle supramolecular assemblies, and thermoresponsive nanogels as novel drug delivery nanocarriers. Find out more about his work on his website (http://www.nanominions.com/) and on Twitter (@nanominions). Nanoscale Horizons is delighted to welcome Professor Eric Detsi to the Community Board! Dr Eric Detsi is Stephenson Term Assistant Professor at The School of Engineering and Applied Science at the University of Pennsylvania, USA. Eric’s primary research interests involve the novel design and synthesis of metal-based 3D nanostructured materials with enhanced properties for structural and functional applications. His approach is to apply the natural sciences, primarily physics and chemistry, to solve engineering problems. In particular, Eric exploits the crystal structure of multiphase non-precious metal alloys to engineer nanoporous materials with hierarchical porosity after selective leaching. Hierarchical porous structures are attractive as alloy-type anode materials in alkali and alkaline-earth metals batteries, because the macropores (50-1000 nm) are needed for long range electrolyte diffusion through the material, while the mesopores (2-50 nm) and micropores (< 2 nm) are needed to create high-surface area and short diffusion paths for alkali or alkaline-earth metals. More importantly, micro and mesopores are needed to accommodate the large volume changes taking place in high-capacity alloy-type battery anodes during their alloying reactions with alkali or alkaline-earth metals. Eric also takes advantage of state-of-the-art thin film deposition techniques such as plasma-enhanced atomic layer deposition, combined with his expertise in top-down nanofabrication by selective leaching, to engineer novel 3D nanocomposites for critical energy applications. Please see his research website for further details. The Nanoscale Horizons Community Board is made up of international researchers who are all at different stages in their early careers, from PhD students and postdocs to early career professors. These scientists are fundamental in the future development of the nanoscience field. Since 2016, Community Board members have provided invaluable feedback regarding journal activities, as well as being ambassadors for the journal both at meetings and through the journal blog. Have you read our most popular Nanoscale Horizons articles from 2017? With 2018 now well underway, we thought to look back and share with you a selection of our most popular articles from 2017. These articles highlight important conceptual advances and insights in nanoscience and nanotechnology, and are all free to access online. Nanoscale Horizons is the home for rapid reports of exceptional significance in nanoscience and nanotechnology, only publishing work that shows a clear conceptual advance. Nanoscale Horizons is delighted to welcome Professor Qing Dai to the Community Board! 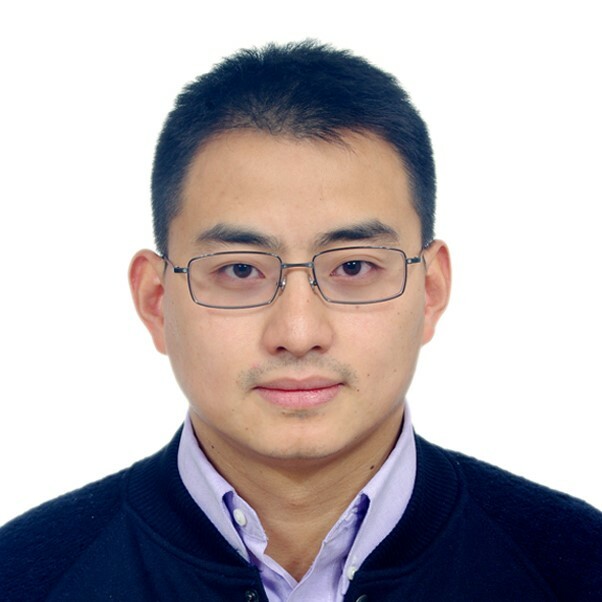 Dr. Qing Dai is a professor in nanophotonics at the National Center for Nanoscience and Technology (NCNST), China. He received his MEng degree in Electronic & Electrical Engineering from Imperial College, London, before coming to the University of Cambridge to pursue a PhD in nanophotonics at the Department of Engineering. After completing his PhD in 2011, Qing was elected as a Junior Research Fellow at Wolfson College and continued as a Research Associate at the Centre for Advanced Photonics and Electronics (CAPE). He received an award from the thousand talents program of China in 2012 and joined NCNST. He has published over 60 peer-reviewed papers in reputed international journals (including Nature Communications, Nanoscale, and Advanced Materials). He is a regular reviewer of various high-impact journals, such as Nature Materials and Nanoscale. 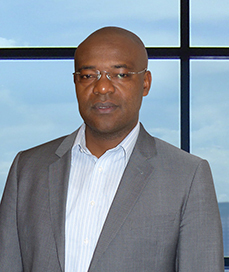 His research interests include: the fabrication of low dimensional nanomaterials (such as carbon nanotubes and graphene) for electronics and optoelectronics; graphene plasmonics; surface enhanced infrared absorption; nanophotonics characterization based on scattering scanning near-field optical microscopy; and ultrafast electron emission from carbon nanotubes.